The Ruston 109 is an old-fashioned guideboat type combining lightness, good looks, and easy rowing. It’s a double-ender with nearly plumb stems, a lapstrake hull, and sweeping sheer. The boat is 14’3” long with a beam of 39-¼”. Many of Rushton’s pulling boats were offered as rowing/sailing combinations with a compact folding centerboard and a rudder with a yoke and steering lines. The plans for the 109 show no accommodation for sailing but do offer a rudder design. No doubt the fashion of the late 1800s allowed a fellow to pull hard on the oars, not seeing where he was going, while his amiable companion pulled the ropes. The lines of the Swallow seemed to offer an ideal compromise of lightness, speed, and roominess. The plans are suitable for skilled amateurs, as there are no step-by-step instructions or patterns for planks. 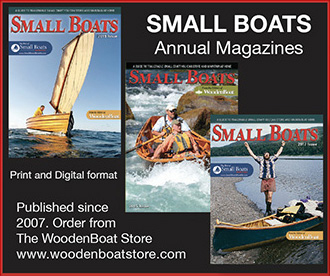 Lofting isn’t required—full-sized patterns for the molds and transom are provided with the plans—but the hull must be lined off and the plank shapes spiled. When I realized each sheer plank might have to be scarfed together from three pieces of plywood, I asked Andrew to reduce the overall length to allow for two 8′ lengths of ply, joined by 10-to-1 scarfs, to have sufficient length for the sheer planks. Andrew agreed, and the dinghy became 14′ 6″. The straight stem and slightly raked heart-shaped transom, coupled with epoxy-glued planking, give the Swallow a very traditional appearance. I had already built a smaller and simpler Devlin boat, the 13′ 6″ Zephyr daysailer, a project that seemed plenty challenging at the time. The Winter Wren, while employing the same stitch-and-glue composite construction that I’d begun to get comfortable with, added the complications of cabin, outboard motor, electrical system, much more structure, and vastly more rigging. Listen, this rig is stout. One day I was scrutinizing a 24′ production sloop whose owner was embarking on a bluewater cruise to Hawaii, and I noted that the much smaller Winter Wren’s standing rigging was far more robust. This gave me a warm feeling. Australian-born designer Michael Storer developed a wooden SUP and named it Taal after a lake near his home in the Philippines. The boats and canoes he designs are light yet strong, and while they may appear to look simple at first glance, they are actually sophisticated, elegant, and fast. His 12′ 6″ Taal is no exception. While many production SUPs resemble surfboards, they are rarely used for riding waves; they’re most often used on flat water. The Taal is designed like a displacement hull rather than a surfboard and optimized for speed, tracking, smoothness of ride, and stability on flat water. My trials in a local lake proved that the boat trailered, launched, and performed remarkably well. The bottom is 5′ 9-1/8” at its widest point, and because of the narrow beam at the waterline, I feared the boat would be rocky, but was pleasantly surprised by its stability. Having the helm 13-1/2′ from the bow on a 20′ boat and off-center does not seem to hurt the performance or the balance. Even with the added foredeck and side decks, the cockpit is still quite open and we are able to move around freely with no obstacles or wires and cables to trip over. The Ilur arrives on pallets as a precut kit with CNC-cut components, including a strongback on which the hull is built. One of the key aspects of the kit-built method is the use of sawn bulkheads and interlocking longitudinal stringers that, as Vivier brilliantly executes, form both the building jig and the majority of the internal furnishings, so that after the hull is planked and flipped, much of the interior has already been completed. The result is an extremely strong hull that can be accurately and quickly executed by professionals and amateurs. The bulkheads and frames are 3/4″ marine ply, the planks are 3/8″. grew up in central Massachusetts, and still live there. When I was a kid, each summer my family rented the same beach cottage near the east end of the Cape Cod Canal. It was there that my love of saltwater fishing began. Around 1990, intrigued by having seen a fellow using a fly rod on . . . The Ski King was designed by company founder Glen L. Witt—a keen water-skier and a boat designer—in 1953, the year he went into business selling plans and kits to home boatbuilders. Although he enjoyed boating in his own Ski King for many years, at some point sales of the plans diminished and they were removed from the Glen-L catalog. But in 1976, Dwain Colton of Portland, Oregon, was keen to purchase a set of Ski King plans which, luckily, were still stored within the company’s archives. As it turned out, Dwain didn’t complete his Ski King until 2003, but the plans are now in Glen-L’s online catalog and “even made it back into our print catalog, which is something that I don’t remember ever happening before,” said Gayle Brantuk, Witt’s daughter who now runs the company. I met this great bloke, Ross Lillistone, a classy sailor, designer, and builder of boats, at a boat show in 2005 and asked him to sell me plans and give me guidance in the selecting and building of a couple of small boats—a 9’ Sherpa that I rigged with a balanced lugsail and 10’ Fish Hook rowing boat—both from designer John Welsford. I’d been happily sailing then with a new cohort of like-minded sailors, but I eventually realized that I needed a faster, more versatile, but still simply rigged boat.